US President confirms worst gun massacre in American history was a terrorist attack; shooter was American Islamist. 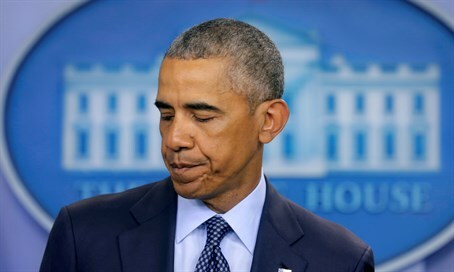 United States President Barack Obama has labeled the deadly shooting attack at a Florida gay nightclub an "act of terror," in his first speech following the massacre Sunday. 50 people were murdered and at least 53 others injured in the shooting spree at the Pulse Club in Orlando. The attack was carried out by American-Muslim terrorist Omar Mateen, who according to reports pledged allegiance to the Islamic State (ISIS) terrorist group. He was shot dead by police offers who stormed the club after a brief hostage situation. "We know enough to say this was an act of terror and an act of hate," Obama said in a statement from the White House briefing room. "The FBI is appropriately investigating this as an act of terror. We will go wherever the facts lead us ... What is clear is he was a person filled with hatred." "This is an especially heartbreaking day for our friends who are lesbian, gay, bisexual or transgender," he added. Vice President Joe Biden also reacted to the attack, and "offered his prayers for all those killed and injured in the shooting and sends his condolences to all the families and loved ones of the victims," according to a statement from his office. World leaders including Israeli PM Netanyahu have also lined up to offer their condolences and condemnation. The attack was the worst gun massacre in American history.